There has always been a stream of successful bands to come out of Manchester with many becoming known worldwide. Bands such as Oasis, The Bee Gee’s, Elbow and the Stone Roses originate from Manchester. Before 1976, Manchester had an impressive pop culture, with bands such as Freddie and the Dreamers and more well known, the Bee Gee’s. May 1965 saw 3 Manchester bands topping the American top 100 with 1, 2 and 3 for a week. Moving on from the pop culture in Manchester saw one of the greatest bands of all time hit the stage, led by Morrisey and Marr this band was called The Smiths. They were well known for their songs that were iconic to the city itself. As the 1980’s came to a close, there was a new music scene brewing around by the Hacienda night club which was part of the Factory Records company. The most well known band to come out of this were the Stone Roses who recently had a comeback tour which sold out Heaton Park. The 1990’s brought bands such as Oasis, The Courteeners and probably most famously, Take That to the stage. Unfortunately, Oasis and Take That split up, but on their comeback tours sold out their events in Manchester, Take That at The City Stadium and Oasis at Heaton Park. The Menchester Arena is the largest venue for the music industry in Manchester, attracting some of the biggest stars to date such as The Kings of Leon, Mumford and Sons and Rihanna. Manchester City Football Club use their Etihad stadium for major tours of bands and artists, and also Old Trafford Cricket Ground which saw Green Day perform their world tour to a sold out Manchester Crowd. Other major venue’s include the Manchester Academy, Manchester Central and Manchester Apollo. The Northern Quarter boasts a variety of bandstands and music clubs, with places like Band on the Wall which have welcomed bands such as Joy Division and Buena Vista Social Club. The Manchester Arena is one of the biggest indoor venues in Europe with a capacity of 23,000 and holds some of the biggest concerts and sports events such as boxing, basketball and swimming in the UK. The arena is based on Hunts Bank and connected to Manchester Victoria. The Manchester Arena was built in 1995 for £52 million and was one of the first venues that followed the American model of 360 degree seating. The venue was part of an unsuccessful bid for the Summer Olympics in 2000. Today, the venue is one of the busiest arena’s in the world attracting millions of fans throughout the year. The arena will be busy even in 2013 with some of the best concerts such as Beyonce, Rihanna, One Direction and Depeche Mode. 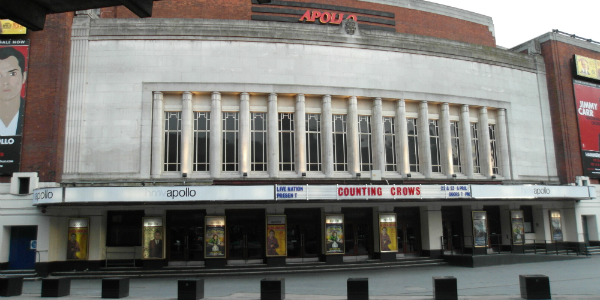 The O2 Apollo is a charismatic small venue with a capacity of 3,500. The venue is regularly used by some of the best new alternative rock and indie bands. The venue was built by architects Peter Cummings, Alex Irvine and R. Gillespie Williams in 1938 and was supposed to be a cinema. Up until the 70’s, it was one of the leading venues in the UK.